This has been a very busy summer so far at our two constructions sites. We have many questions each week about where we are with our projects so we plan to bring you a construction update each month. The goal is to get the building under a roof as soon as possible. 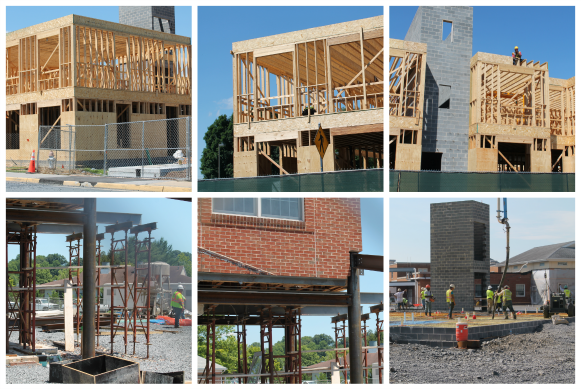 3rd-floor joists are going up on both north and south towers. South tower internal walls will get interior beams that are load bearing. Electricians and plumbers are starting their work. We are still pouring concrete. The structural steel and roofing for the Bistro are connecting the 3rd story of the existing building and they are working on tie-ins. Two 10 floor wide openings for doorways will soon be cut into the Assisted Living area. 3rd Floor renovations in Assisted Living around the Elevator area have encountered. Some difficulty due to some hidden issues with beams in unexpected places. These are being addressed.